A motor branch of the inferior alveolar nerve, a branch of the mandibular division of the trigeminal nerve (V). Due to the position of the submandibular gland a referred pain at the mylohyoid muscle could be present. 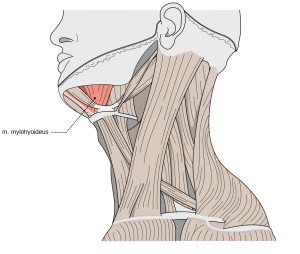 On intra- and extraoral palpation, find a sheet of muscle attached to the whole length of the mylohyoid line of the mandible and extending to the body of the hyoid bone. Use the index finger to slide all over different sheets. Continuous compression should be applicate less than 20sec. Anatomy and variations of digastric muscle. ↑ 1.0 1.1 Gray, Henry. Anatomy of the Human Body. Philadelphia: Lea e Febiger, 1918; Bartleby.com, 2000.